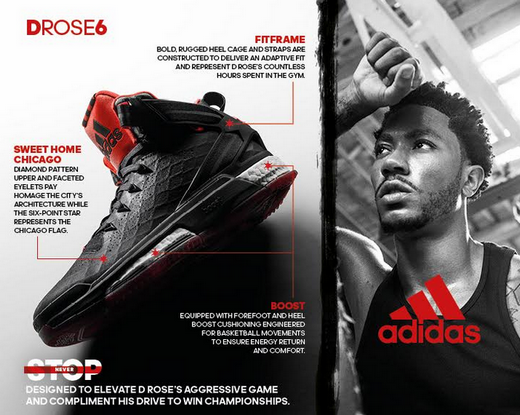 D Rose 6 adidas Basketball Shoes, Photo, Price and Release Date in the Philippines: Details here! Engineered to Boost his game. Designed to Never Break. PORTLAND, Ore. – A kid from Chicago’s Englewood neighborhood is not supposed to be the No. 1 overall pick by his hometown team and the youngest MVP in NBA history. The league’s top point guard is not supposed to have his will tested by suffering back-to-back season ending injuries and become nearly written off. But not every player is Derrick Rose, who learned toughness and resilience from his family and neighborhood to develop an aggressive game and cold, confident demeanor that remains unchanged. Derrick continues to prove that he will never break. Returning to the playoffs for the first time in nearly three years, he averaged more than 20 points and 6 assists and drained an unforgettable buzzer-beater to help give the Bulls a victory in Game 3 of the Eastern Conference Finals. While the squad would drop a hard fought series, Rose proved he’s still capable of dominance on the court. Embodying Rose’s journey of overcoming adversity with hard work and perseverance, adidas unveils the D Rose 6. Inspired by his will to never break, the silhouette is designed to elevate his aggressive game and compliment his drive to win championships. The D Rose 6 (Php 8,995) launches Globally on October 15 in “Home” and November 5 in “Road” colorways with five more editions unveiling through the end of the year.